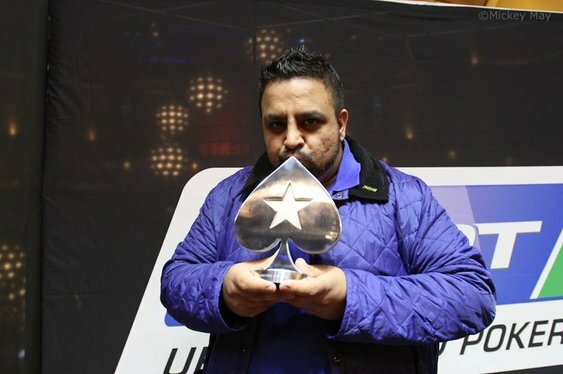 The 2015 PokerStars UK and Ireland Poker Tour (UKIPT) season got off to a flying start with tournament novice Rapinder Cheema taking down the opening event in London for a cool £78,825. Not bad a bad return for a maiden tournament triumph. Cheema, whose only previous live score was £320, topped a field of 742 runners at the Hippodrome over the weekend to secure his bumper payday. The big story heading into Sunday's finale was Brett Angell. Last year's champion was looking for unprecedented back-to-back UKIPT wins but his bid for glory would eventually stall in seventh at the hands of the eventual winner. Despite knocking out the most well known player at the final table, there was still plenty of work for Cheema to do to secure his first tournament win with the likes of Supernova Elite Lawrence Bayley still at the final table. Once Bayley, Paul Simmons, Christopher Yong and Martin Hanham hit the rail it was left to UK-based Spaniard Fernando Marin to battle it out with Cheema for the title. The inexperienced Briton overturned a chunky heads up deficit, the fickle finger of fortune pointing in his direction just when he needed it to. Marin was just one hand away from the title but Cheema came from behind with Ad2d to beat the Spaniard's As7d and take control. It was all over a hand later when Cheema's flopped set crushed the unfortunate Marin's flopped two-pair. "It's a good feeling" Cheema told the PokerStars blog "I'm a bit drained. I need to work on my stamina!" A big shout too to third place finisher Martin Hanham. The tube driver qualified managed to parlay a £5 tournament token into a £41,000 pay day! The next stop for the UKIPT is Dusk Till Dawn in Nottingham. Qualify online at PokerStars. Image courtesy of Mickey May and PokerStars.